Five days in Berkeley were enough to make me realize that I want to go back. The pleasant atmosphere on the campus, together with the professors we met, gave me a warm and homey feeling. These five days were quite busy: we visited a number of places, including many special places that left a strong impression on me. On our first day at the university we visited the Anthropological Museum, which contains over two million art exhibits (they are not displayed simultaneously). The university has an impressive history and this was evident in the museum. The tour dealt with our awareness of the people who produce the things we wear. Nowadays, when most of the products purchased are made in China, the reference to the inventor, the designer and the manufacturer is almost nonexistent. The excellent exhibition gave a central place to the people who created the product and raised this subject for discussion. 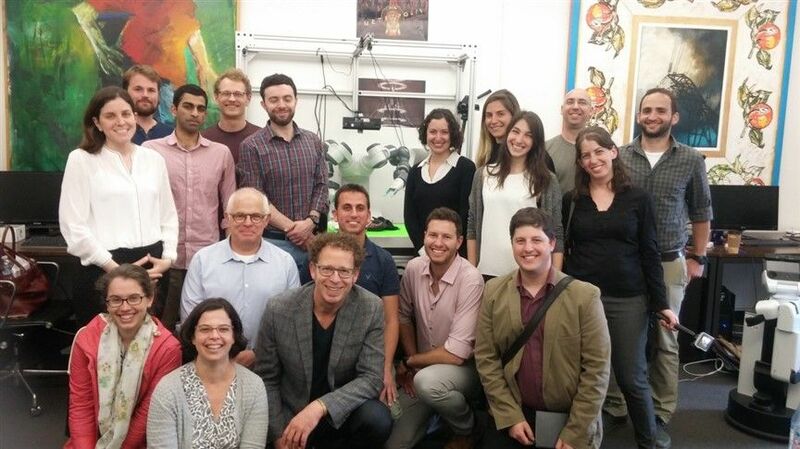 On the second day at the university, we visited the robotics lab under the management of Professor Ken Goldberg. This lab has about 15 students working on projects in a variety of subjects such as a cloud robot that can process information, store it at maximum speed, and share it. This lab is being developed with leading companies such as Cisco, Google and Siemens. In addition, the lab develops robots that help doctors in the operating room and are currently learning to sew up the patients on the table through experiments on various objects in the laboratory. The visit was fascinating and laboratory was innovative. It was especially exciting to meet an Israeli postdoctoral student in the lab who is a partner in the advanced developments and to meet with other young students responsible for the development of the groundbreaking technologies presented to us. We spent most of our third day in the master’s degree in development practice and sustainability building. We met with the leading faculty of a new program that began in 2011 and whose first students graduated in 2014. The program trains students from around the world to address the challenges of sustainable development. Students study in the classroom during the year, and during the summers, they are responsible for finding an internship anywhere in the world, to learn about the place’s challenges and help develop new solutions. We heard from the program directors about the graduates’ successes and their placements in the workforce. We heard from students participating in the program about their projects and how they connect to their summer specializations. We were pleased to discover that the Hebrew University, in cooperation with this program, will be opening a similar program next year, a program that does not yet exist in Israel. We spent our fourth and fifth days mostly in San Francisco, a half-hour drive from Berkeley. We were exposed to local policy and business centers and were given an interesting tour at Google’s offices. At the Policy Institute we visited, we received an explanation of their great work on the drought in California (a topic that was mentioned throughout the whole Berkeley visit). The Institute has set itself the goal of improving public policy by conducting in-depth studies on a wide range of issues that influence public decisions in every field. The five days we spent in Berkeley were an unforgettable experience, in which we learned a great deal about the various topics I described above. We also learned many new things about subjects we have never been exposed to before, and that the university and other private organizations are very involved in (e.g. the California drought). As I wrote in the beginning of this blog, the visit to Berkeley is definitely not my last.